Owning a dog or cat is a wonderful thing, but you can contract skin rashes from them, especially if you're allergic or if the pet has a particular skin condition. Skin conditions can include allergies, flea-bite dermatitis, cat scratch disease, and ringworm. Although somewhat unusual, people who have pet allergies can have the allergy manifest itself as hives and itchy skin due to direct contact with the animal. Allergy medications may be able to prevent this. 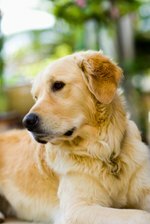 Just like your pets, you can get bitten by fleas and experience an allergic reaction to the flea bites. Keeping your pet flea free will prevent this from happening. Cats can carry the bacteria Baprtonella henselae, which causes cat scratch disease. The disease starts as a blister or bump where the infection began and eventually causes swollen lymph nodes, fever, rash, sore throat, and a generally ill feeling; you'll need antibiotics from your doctor to treat it. Ringworm is a fungal infection that you can get from your pets. It looks like a ring-shaped, circular red rash with a clear center; if you have it, you'll need to be treated with antifungals. You should always see a doctor concerning any rash and receive appropriate treatment.